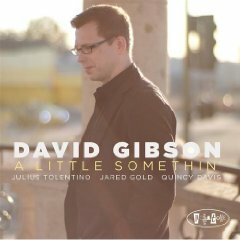 Trombonist David Gibson delivers another album full of melody and grounded in a strong sense of purpose on his new CD A Little Somethin’ (Posi-Tone, 2009). Gibson is a veteran of the Dizzy Gillespie All-Star Big Band, and a leader in his own right. In this interview, Gibson talks about the importance of melody in his writing; the sound of a working band; and why he chooses to focus on original compositions. Find out more at jazzbone.org.